Create this quintessentially English classic to perfection with our silky smooth, delectable egg custard mix, that can be enjoyed by all of your family and friends. All you need is a pre-cooked pastry base and a little dusting of nutmeg to recreate this true family favourite to perfection! Ready, get set…go! Create fabulously fruity flans in a flash with our Red Quick Jel. This easy to use gel sets your creation and enhances texture and flavour sensations that are a real treat for everyday, parties or special occasions. Ready, get set…go! 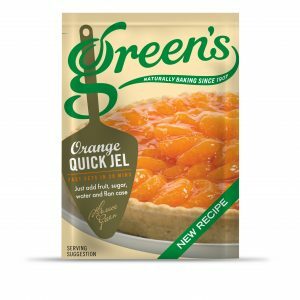 Create fabulously fruity flans in a flash with our Orange Quick Jel mixture. This easy to use gel sets your creation and enhances texture and flavour sensations that are a real treat for everyday, parties or special occasions, try it as soon as possible! Indulge in a rich velvety cheesecake on a crunchy, buttery biscuit base and lead your friends and family into temptation. Make this dessert quickly and easily and personalise your creation by topping with sweet summer fruits, dusting with cocoa powder or decorating with shards of rich dark chocolate, make your choice. There is so much you can do with such a simple product, all from the comfort of your home with this simple cheesecake mix! Or why not test your own baking skills with some different ideas to embellish this classic dessert?